Here are a couple of interesting quotes from John Calvin. 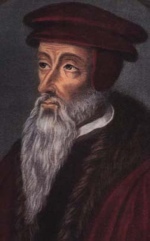 Did John Calvin believe that humans are robots, or is that an unfair characterization? – John Calvin, Sermons on Acts 1-7, Sermon 41, Acts 7:51, p., 593. Yet sometimes he also causes those whom he illumines only for a time to partake of [grace]; then he justly forsakes them on account of their ungratefulness and strikes them with even greater blindness. – Institutes of Christian Religion, 3.24.8.